Mary reached out to me a few months ago inquiring about eloping with her fiance, Phil. Mary and Phil are former van-dwellers - they left their home in Southern California to travel the country in their Sprinter Van named Rover. They eventually settled down in the Seattle area after traveling for multiple months. Mary mentioned that her and Phil both wanted a photographer that was as passionate about adventure as they were- I'm so happy they found me, because I love when couples are as passionate about adventure as me! We decided an overnight backpack elopement was down their alley and started planning from there. I asked Mary what they were envisioning for their day, which she mentioned she wanted something that made her feel small. 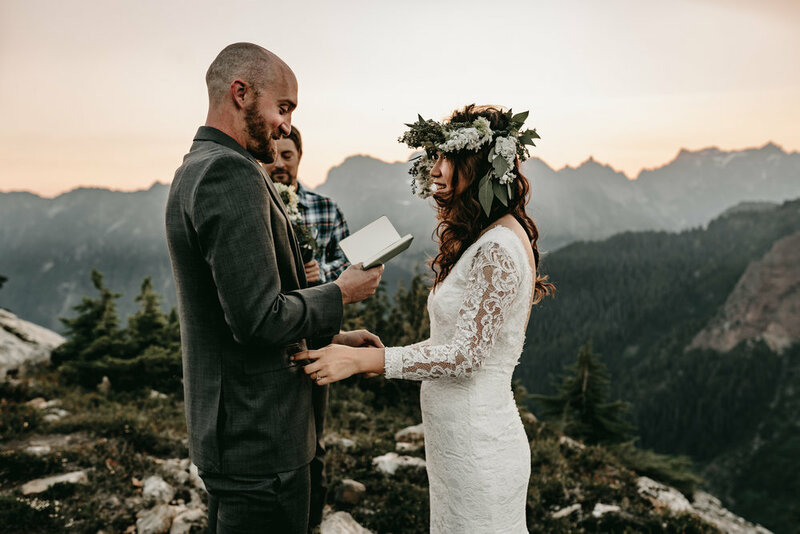 They wanted recommendations for locations to say their vows, I sent over a few and we decided on this beautiful location situated in the North Cascades, for a vow exchange at sunrise. The hike to the location was definitely some Type II fun. It was about 9.5 miles total with 3,000 feet of elevation gain in less than 3 miles. I personally enjoyed the hike, with my favorite memory (aside from the destination) was the non-technical scrambling up the side of a waterfall, as it was hot on the day we hiked in. We set up camp and crawled out of our sleeping bags at 5:30AM to get Mary and Phil married. It was an absolutely beautiful ceremony. After the ceremony, we explored the beautiful area and danced in the warm light of the morning, while fighting off the mosquitos. Congratulations to Mary and Phil on the start of their new adventure together as husband and wife- I'm so thankful to had been included in such a special day.